She used to tell me everything. They have a picture. It'll help. But it doesn't show the way her hair shines so brightly it looks like sheets of gold. She smells very faintly of lemons. She bites her nails. She never cries. She loves autumn, I wanted to tell them. She collects leaves, like a child does. She is just a child. FIND HER. Naomi is still missing. Jenny is a mother on the brink of obsession. The Malcolm family is in pieces. Is finding the truth about Naomi the only way to put them back together? Or is the truth the thing that will finally tear them apart? The book is told through the eyes of Jenny Malcolm - doctor, wife, and mother to twins Theo and Ed and, of course, 15 year old Naomi; who goes missing on a Thursday night after a school performance. The book jumps straight into the action, with Naomi's disappearance taking place after just 12 pages. I love it when books do this - we know whats going to happen after reading the synopsis, so it's better to just get stuck into the plot line as soon as possible, in my opinion. The novel flits between the past and the present, following Jenny's life now - one year after the disappearance - interwoven with flashbacks to the night of the disappearance, the weeks leading up to it and the immediate aftermath. It quickly becomes clear that Jenny didn't know her daughter - or her family - very well at all, as shocking secrets and revelations unfold around her. 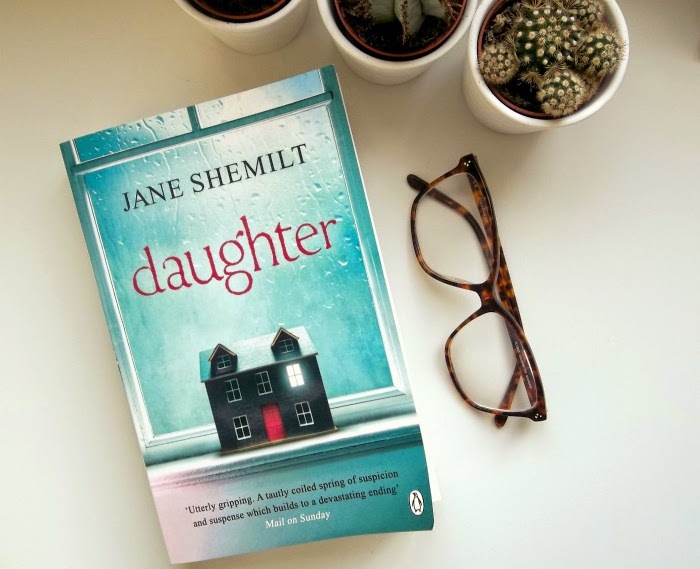 'Daughter' is obviously every parents worst nightmare and Shemilt portrays Jenny's character really well - a mother torn apart by worry, anguish and guilt - constantly blaming herself for Naomi's disappearance and battling with harrowing thoughts of what might have happened to her daughter. Although, I have to say that, even by the end of the novel, I struggled to actually LIKE the main character. With this kind of story, you want to be on the parents side really. In 'The Missing' I really felt for James Nesbitt's character and could feel his pain and his distress but there is something about Jenny that makes her seem a bit detached. I'm not necessarily saying this is a bad thing, as such, but I just didn't find myself sympathising with her as much as I would have liked to. However, the story itself is absolutely packed with twists and turns which is a vital ingredient, for me, in a good thriller. If I can guess the outcome, then I will class it as a disappointment, but not at one point did I guess how this story would end. Unfortunately, the ending did disappoint me - I don't want to ruin it so I won't say anymore. I've read other reviews which said they thought the ending was amazing so don't let this put you off. Disregarding the ending, the book was incredibly gripping and had me guessing the whole way through. It's a tightly woven tale full of mystery and suspense. If thrillers are your cup of tea, I would definitely add this to your 'to read' list. Have you read 'Daughter' or are you planning to? What have you been reading that you can recommend?